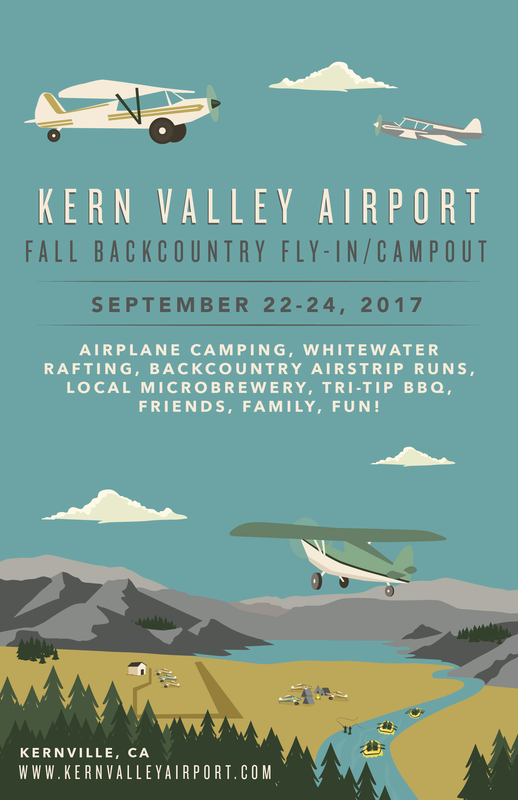 What a great weekend we had at our Fall 2017 Backcountry Fly-In/Campout hosted by both Kern Valley Airport and The RAF (Recreational Aviation Foundation)! All in all, over 30+ planes and 60+ people (including the Mt. San Antonio College students on hand) came, hung out, camped, flew, and feasted! After everyone set up camp in our campground on Friday night, we held a briefing for the next day's fly-outs, then shuttled everyone to the Kern River Brewing Company for their world-class selection of local brews, and finally we all enjoyed a good time around the airport campground bonfire afterwards. Saturday our own Dustin Mosher led a fun fleet of planes on a multi-desert airstrips run (see video below), Saturday night Sierra Vista Restaurant towed out the grill and cooked us up a ton of mouth watering tri-tip with all the fixin's, that evening we all enjoyed a great time around the campground bonfire, and Sunday morning the crew flew up to Carver's Cut and even Monanche Meadows for some spectacular backcountry mountain flying in the local Sierra Nevadas! The attendee group numbers and friendships that have come out of it have really grown -we were glad to have both at our little Kern Valley Airport campground and are looking forward to our next fly-in Spring 2018!